Cold therapy or Cryotherapy is a popular treatment method for sports injuries. In particular, the PRICE principles of PROTECTION, REST, ICE, COMPRESSION & ELEVATION are often important emergency first aid treatment. Should I apply hot or cold? The PRICE principles are the gold standard set for treating acute sports injuries. The acronym stands for Protection, Rest, Ice, Compression and Elevation. PRICE should be applied as early as possible after the injury and continued for at least the first 24-72 hours. If applied early enough and correctly it can significantly reduce the recovery time of the athlete. Protection of the damaged tissue is vital to prevent further injury and damage to the tissues. This can be in the form of immobilization with a splint or sling, wearing a support or brace or sports taping techniques. Rest is essential to allow injured tissues to heal and is often overlooked. Rest may mean complete rest, or it could just mean modifying training activities, for example switching to running for a hand injury. Ice therapy, cold therapy also known as cryotherapy, is one of the most widely used treatments for acute sports injuries. Ice can decrease swelling by constricting blood vessels, reduce pain by blocking pain signals to the brain, reduce muscle spasm and decrease the risk of cells dying by decreasing the rate of cell metabolism. Applying compression to an injured area reduces the amount of swelling that forms following an injury in two ways. The first is by compressing the injured limb which narrows the blood vessels (vasoconstriction) and prevents excessive bleeding. Secondly, it moderates the amount of fluid (called exudate) that the body produces to protect the injured tissue. Compression should be applied for the first 24 to 72 hours from the onset of injury. Elevating the injured limb is equally as important as the other 4 and allows gravity to drain the fluid away from the injured site. This helps reduce swelling which in turn may decrease the pain. Read more on the PRICE principles. A contraindication to cold therapy is an injury or condition that would make applying cold therapy to a sports injury dangerous. This means that if you have any of the conditions below then applying cold therapy is likely to be bad for you or cause further injury. The following list is not exhaustive and we recommend seeing your Doctor for professional advice if you are in any doubt. Raynaud’s is a condition affecting small blood vessels in the extremities (hands and feet). Symptoms include a change in skin colour when exposed to cold and the hands and feet may feel numb or be painful. Cold Erythema – A rash, characterised by redness and itching, caused by exposure to cold. Can cause severe pain and muscular spasms. Cold Hemoglobinuria – When red blood cells break down so quickly that some haemoglobin cannot combine with blood proteins. When there is an area of numbness or altered sensitivity, cold therapy should not be used as the patient will be unaware of pain levels, and the degree of cooling. The following conditions are considered controversial. They can be treated with cryotherapy, although extra care may be needed. Again, we recommend seeking professional advice if you are in any doubt. Cardiac Conditions – such as Arthymia, Angina or CHD. High Blood Pressure – Vasoconstriction could serve to increase blood pressure. Superficial Nerves – Cold therapy should not be used on an area where nerves pass close to the surface. Healing Wounds – Cold therapy should not be used over a new wound. Should I apply hot or cold therapy? There is often confusion following an injury concerning whether to apply cold therapy or whether to warm the area. The answer depends on the type of injury you have sustained. Acute injuries are those which result from traumatic incidents, for example, a fall, twisting movement or direct blow for example and are immediately painful. When an acute injury first occurs, bleeding, inflammation, swelling, and pain must all be controlled. Ice should be applied as soon as possible in order to cool the tissues, reduce their metabolic rate and nerve conduction velocity and cause vasoconstriction of the surrounding blood vessels. Following approximately the first 3-5 days of an acute injury, once bleeding has stopped and there are no signs of inflammation, you may wish to alternate cold and heat treatments. That applies cold for 10 minutes, followed immediately by 10 minutes of heat. Doing this causes massive increases in blood flow to the area as the vasoconstriction caused by cooling reverses when heat is applied, resulting in an influx of blood to the damaged tissues. Ensure all bleeding has stopped before applying this technique. Blood is vitally important in providing all of the energy and nutrients that the body needs for repair. In general, heat should be used to treat chronic injuries, to help relax tight, aching muscles and joints, increase the elasticity of ligaments and tendons and increase the blood flow to the area. Heat therapy can also be used prior to exercise in chronic injuries to warm the muscles and increase flexibility. Heat treatment is used as a therapy for many sports-related musculoskeletal injuries. There are many forms of heat treatment, with the most effective often depending on the injury in question. The timescale is also an important factor when deciding whether to use heat therapy. What are the benefits of heat? When should I use heat treatments? Heat therapy should be used on chronic injuries and late-stage acute injuries. A chronic injury is one that has persisted for a length of time and is usually due to overuse and biomechanical issues, as opposed to a traumatic incident. Heat can be used before exercise to warm the muscles but should be avoided after exercise. At home, the easiest way of applying heat to an injury is by using a widely available heat pack. These can be made of varying materials, often gel or wheat based which either require heating in a microwave or submerging in hot water. Wrapping such an item in a towel and applying it to the injury is perfectly suitable. This should be applied be 15-20 minutes at a time. Warm, damp towels, warm baths, and heat rubs can also be easily used at home although may not be as effective at warming deeper tissues. What are the contraindications to using heat? Most of these are due to the massive increase in blood flow to the area. With conditions such as infection or malignant tumours, heat would increase the risk of spreading the infected or cancerous cells in the much-increased blood flow. Cold therapy or cryotherapy has a number of effects on the body both immediately after injury and later in the rehabilitation process. The reason behind the application of ice resulting in pain relief is not clear. There are many theories and it is possible that a number of the proposed mechanisms in combination can cause pain relief. Some of the possible mechanisms include the following. Decreased nerve transmission in pain fibres. Cold reduces the activity of free nerve endings. Cold raises the pain threshold. Cold causes a release of endorphins. Cold sensations over-ride the pain sensation – known as the pain gate theory. By cooling the surface of the skin and the underlying tissues, ice causes the narrowing of blood vessels, a process known as vasoconstriction. This vasoconstriction leads to a decrease in the amount of blood being delivered to the area and subsequently lessens the amount of swelling. After a number of minutes, the blood vessels re-open (dilate) allowing blood to return to the area. This phase is followed by another period of vasoconstriction- this process of vasoconstriction followed by dilation is known as the Hunting Response. Although blood still flows into the area the amount of swelling is significantly less than if ice is not applied. 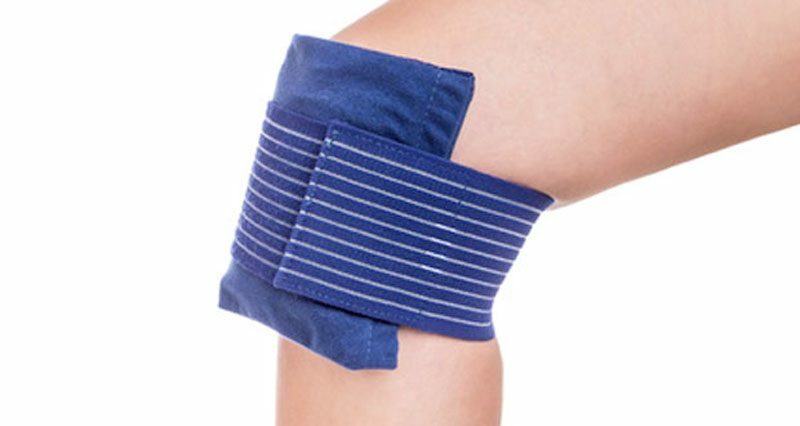 This decreased swelling or edema, allows more movement in the muscle and so lessens the functional loss associated with the injury. Muscle spasm is often a response to pain. The muscles surrounding the injury contract to protect it. This is known as muscle guarding and it aims to prevent further damage. Ice, being useful for pain relief is therefore beneficial in reducing muscle spasms. However, it is also thought that muscle spasms which are not caused by acute injury but more muscle overuse or imbalances can also be reduced through the use of cold therapy. This is not fully understood but is thought to be due to ice slowing the conduction velocity of sensory and motor nerves, as well as the activity of muscle spindle cells which are responsible for muscle tone, resulting in a decrease in motor activity. By reducing the cells metabolic rate, ice reduces the cells oxygen requirements. Thus when blood flow has been limited by vasoconstriction then the risk of cell death due to oxygen demands, called secondary cell necrosis will be decreased. Ice or cold can be applied to the body in a number of ways. These include ice baths, ice massage, gel packs, cryocuffs, cold sprays and instand chemical cold packs. Read more on ways to apply cold therapy. Cryokinetics is a rehabilitation technique involving ice application followed by progressive active exercises. It has been shown to be very successful in treating ligament sprains. Cryokinetics basically allows exercise which is pain-free, relatively soon after the injury. The anaesthesia or numbness arising from ice application does not remove pain-sensing mechanisms, it only removes the current pain from tissue damage. So if active exercises are too vigorous pain will still occur. Cold should be applied for a maximum of twenty minutes which should be sufficient to produce the numbed response which is required. The process can be repeated for 5 minutes to re-numb the area if necessary. The exercises performed during cryokinetics are active which means the patient performs them independently of any help from a therapist. They should be gradually increased in intensity providing they remain pain-free. The key to the success of cryokinetics appears to be progressing as quickly as possible from one exercise to the other. Unlike conventional rehabilitation programs where a certain number of reps must be completed, if the athlete can perform the exercise, smoothy, and pain-free then they can progress. Exercise increases blood flow to the injured area, vital in healing, once the initial acute phase has passed and any bleeding has stopped. Cryokinetic exercise re-establishes neuromuscular function and is possible much earlier than normal and as such atrophy or wasting of the muscles has not had time to set in. Swelling is reduced dramatically through the combination of cooling and exercise. Cryostretching is a technique combining cold therapy or cryotherapy and stretching. Application of a cold pack is used to reduce muscle spasms and so increase flexibility. It involves three phases of cold application, static stretching and then contract-relax technique. First the body part is cooled for up to 20 minutes in which time it should become numb. Following these two sets of 65-second stretches are applied with a 20-second rest between sets. Each period of 65 seconds consists mainly of static stretching, with three 5 second isometric contractions interspersed throughout the stretch. There should not be any pain throughout the procedure.